“We went to the reservoir and saw soil sliding down. Water was leaking under the wall,” said local villager. 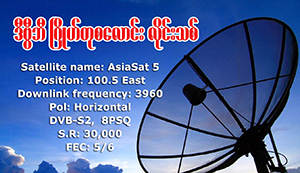 The Pegu Division official subsequently lodged a complaint with police under Article 66(d) of the Telecommunications Law. The translator for a South Korean NGO worker under police investigation for alleged possession of yaba pills has been detained, according to local police. The victim, a young woman, was allegedly murdered by her lover, an air force serviceman, in Okshitpin town on 30 September. Win Naing was rushed to Phyu Hospital, but later transferred to Rangoon General Hospital as his condition worsened. A truck transferring female inmates between Prome and Thayet prisons in Pegu Division has crashed on a highway, leaving one dead. The incident is the latest in a spate of violent confrontations between law enforcement officials and illegal loggers in Kyauktaga Township. He played in public a video file that had been circulating on social media of a man ranting in vile language about Suu Kyi and the government, calling the state counsellor a “whore”. More than 90 people have been treated for dysentery at the public hospital in Prome, with at least half of them suffering from acute symptoms. Law enforcement officials in Pegu Division’s Kyauktaga Township open fire on trucks carrying illegal timber as they tried to run a checkpoint. Eight Letpadan activists have revoked their lawyers’ power of attorney rights, declaring they have no confidence in the judicial system. Undeterred by his dismissal as ruling party chairman, Shwe Mann hits the campaign trail, promising voters in Phyu better transportation and electricity. More than 400 candidates from three new political parties devoted to representing Burma’s farmers will contest seats in the upcoming November election. The town of Padaung, ten kilometres south of Pyay, has been almost completely inundated. Locals from some 30 villages have been evacuated to safety. Who would be a DVB reporter? It’s not easy being a journalist. So says Ko Myo Zaw Lin, who was today sent out to the town of Pegu to cover the ongoing floods. Seven activists incarcerated at Tharawaddy prison have been placed in solitary confinement as punishment for bringing in prohibited items. A student collapsed in court on Tuesday whilst attending a hearing for Letpadan education protestors at Tharawaddy township court. 35 activists have been banned from receiving prison visits amid allegations of family members smuggling prohibited items to their loved ones in jail. One activist faints at a pre-trial hearing at Tharawaddy court, allegedly from injuries sustained in the police crackdown in Letpadan on 10 March. Telenor posts record revenues; Carlsberg opens beer factory in Pegu; Burma poised to be leading rice exporter; and rents in Rangoon on the rise. Terrified locals in Taungoo must have thought it was WWII all over again when the Burmese army carried out testing of air-to-ground missiles. “We have been brought before the court many times, but our case is yet to be heard,” said detained student Yan Paing Soe. Sixty-nine people – 58 men and 11 women – were each charged in Letpadan court on five accounts, including rioting and disturbing public tranquillity.